Posted on August 26, 2014 by Lena K.
Keiko and Ran are living together as roommates. One day, Ran decides to introduce stretching to Keiko, making this a daily routine for the two of them. Yup, that’s kind of the whole plot of the manga, and in all honesty, that doesn’t sound interesting at all. But as always, we shouldn’t judge too early. Stretching is probably the main theme of the manga, and it keeps reappearing throughout the whole thing, but is it really that important? Nope, it’s not. I’m actually skipping through this most of the time, because it’s not important to the rest of the story at all. What this story is all about, is hardly the fact that they someday started doing stretching. This manga rather focuses on the relationship between the two protagonists, Ran and Keiko. The chapters are unfortunately extremely short and don’t overlap into the next chapter, which doesn’t leave much time for some deeper plot developments. Also, it all feels quite rushed, thanks to the way every chapter just shows another moment in their everyday life, only rarely picking up where they left off in the last one. Personally, I see this as something quite irritating, but someone else might actually like it exactly for that. Furthermore, the whole plot doesn’t seem to move towards anything really. It’s just the two of them interacting with each other in one way or another. It’s funny in some parts, a little yuriish in others, but in general, it feels a little boring to me. It has its moments, though. However, we should not forget about one specific chapter that probably didn’t sit well with many of us. I won’t spoil what is going on, but let’s just say that there is one chapter that simply doesn’t fit in with the rest of the manga. It’s dark, tragic, and really irritating. I have a feeling as if what we saw in this chapter will be revisited at some point, but I’m not so sure whether I really want to read about it again. Now is the time to finally mention that this manga is done by the same artist that created my second favorite manga of all time, Prism. Just like in Prism, the art is pretty nice, but it looks like it’s a little more on the simple side. The backgrounds, for example, are often left blank or are really void of much detail. I guess there are not that many people that will be bothered by that, but I kind of pay attention to this stuff a lot. As mentioned above, the subtext is there, even though it’s not really heavy. For some reason, I can see them as more than just friends, but then again, I’m a yuri fangirl, and I can basically see any kind of female character being in a relationship with another girl. In their case however, the way they interact with each other makes it quite hard for me to not hope for a yuri ending. Unfortunately, though, I don’t see this happening. Well, I have no idea for how long this manga will be running, so maybe there still is some hope for us. This manga has been running for some time now, but even though I enjoy the characters quite a bit, I can’t really say that I’m a real fan of it. Also, I just can’t help but compare it to Prism, even though these two manga don’t have much in common at all. I think I was just hoping that this one would finally fill the gap that Prism left us with, but I guess I was wrong from the very beginning. Nevertheless, I will still continue reading this, and my hope won’t die off until the very last chapter. 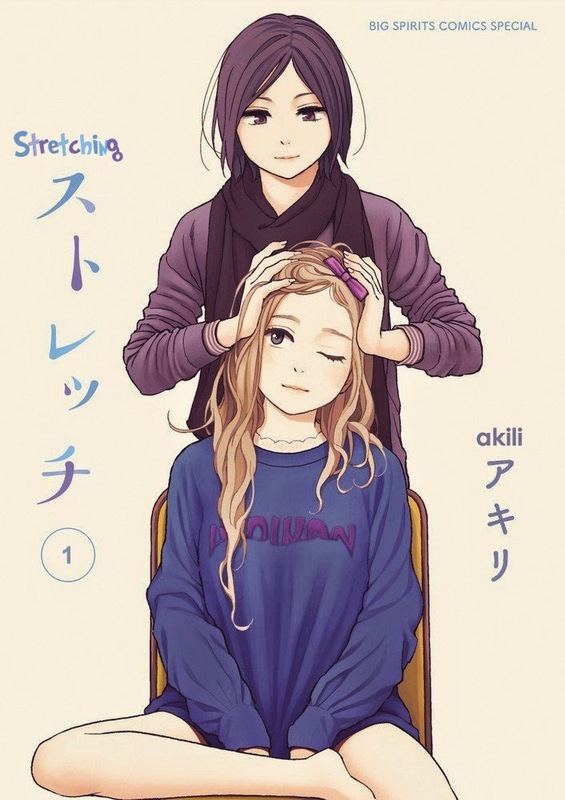 This entry was posted in Manga, Manga Review, Yuri and tagged Higashiyama Shou, Stretch by Lena K.. Bookmark the permalink. I love it for the art and the simplicity and the lack of melodrama tbh. 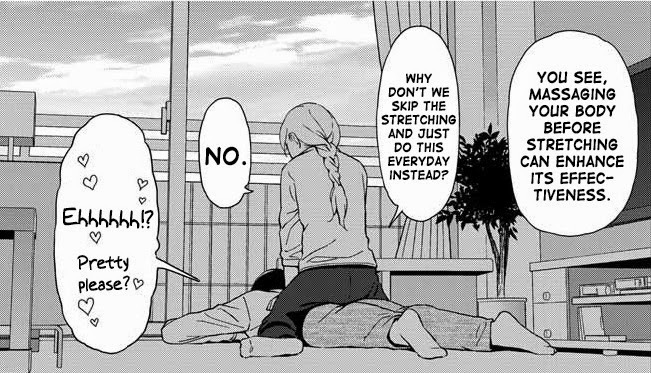 It feels like a lot of yuri follows a kind of generic formula and it's really refreshing to read a manga that doesn't make any attempts at relationship drama. It's not comedy and it's not drama and it doesn't pretend to be either! I like that. This is exactly why I think so many people like this so much. For me, it's just a little boring without the drama. Oh great. You reviewed the beast of Versilles!!! The destroyer!!! The whore of Babylon!!!! You must cast it into the fires of the 8th circle of hell!!! In normal speech, I find Sketch one of the worst manga's i've ever read. 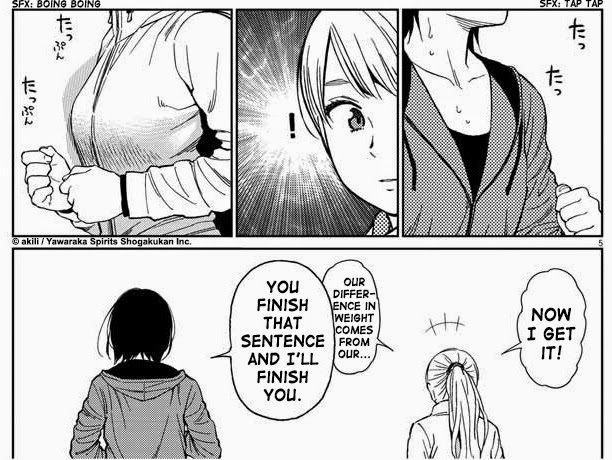 It's a Yuri tease, as well as just a stupid stretch manga. I wrote another really wordy (but nice and totally respectful) reply explaining my love for Stretch – it was a masterpiece, I tell ‘ya – but it vanished with one stupid stray mouse click, so you’ve been spared. Maybe I’ll be able to recreate it and post it (along with all the stock food pictures) on my page? I like food a lot, and cooking is a passion of mine, but…well, I think you know what it will be about, should it ever materialize. I will be sure to let you know! Can't say that I like HIShou' s new “corner of the magazine-ish” manga. Btw, have you reviewing Battle Athletes Daiundōkai? The manga hasn't been scanlated completedly but the 6episode ova series and the retelling 26 episode series are subbed- B.A.Daiundokai was one of those manga in the early days (girls bond over sports and thus they become a bit more than friends~ It wasn't so blatant to tell us that these bonds tread on the lines of really great friend love but the series definitely has those strong touching moments that make one's heart skip. I liked the ova Kris x Akari but I like the manga Akari x Jessie as well (which isn't so well shown;or rather, I was confused on what direction the manga was going in). Anyways~ the ova series was nice, cheek kisses, one direct yuri kiss~! also what is your fav. Touhou pairing? Never heard of Battle Athletes Daiundōkai. I try to stay away from really old shows, which is also why I still haven't watched Utena. …and until now I've forgotten of Utena (笑)! Regardless, I'm still gonna recommend Battle Atheltes to you, it's not as long as Utena and it might be unexpectedly appealing~ (the 6 OVAs I recommend, not the anime). I usually don't turn down recommendations, I at least put them on my list, but in this case, I'm pretty sure I won't watch it, because it just doesn't look like something I might enjoy. The first time I saw it I was like “Oh, my… what a cute drawing”, then I was like “OH MAI GAD, Higashiyama Shou, this is going to be great!” then I actually read the story, and I was captivated by the educative side of the story, and then with the true story. Nowadays I laugh really much with this series… though the “not-sure-if-this-is-yuri” thing disappoints me a little. I think this manag really splits the fandom. You either like it, or you don't, there is not much in between. shou is a great manga his stories are on top, usually his style involves music and classical. if you know his lolicon works which DISCLAIMER really over the edge, but the stories are amazing. This manga only a little similar with Prism. In addition, one chapter has a ten pages. But I must say that Stretch very good manga, as it tells the story of people's lives. She even similar in spirit to the manga Octave, except that in the Octave were shown in detail yuri-relationship between the two main characters. But I also sincerely hope that at the end of the manga Stretch, Run Keiko and will meet not as Senpai and kōhai as well as yuri couple. In addition, I hope that after the Stretch, Higashiyama Shou resume work on Prism and completely finish it, and me and all yuri otaku want to know what the outcome of the story Megumi and Hikaru. Well, maybe he will start working on a new yuri work after this one? You just thought it was “irritating”? I need to ask, did o catch was information was being conveyed there? That chapter was fantastic, superb symbolism. I liked this manga since the first time I read, and while waiting for the chapter I liked it even more when I reread the chapters and noticed more details. The absolute spotlight of Stretch is it’s subtlety. Never is explicitly explained, but you receive enough hints to understand what is happening. IMO, Ran was gay, and very gay for Keiko, but Keiko was straight. And most importantly, Keiko wanted to conceive a child. The two could do something about the after some thinking, but Ran left when she felt that both her and Keiko had “healed” enough with one another’s help.